Hello. I think someone else had this question also but I didn't see an answer. I'm a newbie to modern web dev, til now, an old-school, legacy programmer. I have got your code working on my server but, when the left nav is expanded, the small-nav is hidden behind the expanded navbar. I would like to move the small-nav over just to the right of the expanded navbar when it is opened so it can be re-collapsed. A year from now, I will look back at this and laugh at my ignorance, but right now, it is a pain. THANKS! This is great. My first time posting so I hope I am allowed to post code. I made a minor modification to help those who want the nav to resize with the page. how can i do it on my page? 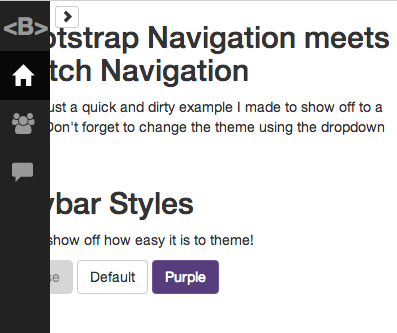 i try to copy your code and add the other file from bootstrap 3.1 and when the page load the nav-open and nav-close are displaying at the same time and when i click it the sidebar will show and the nav-open and nav-closed will disappear. Quick question, how do we have the same username? You should just have to replace the span with an img tag. The only thing is to make sure you image is the same size as the font. hi ! 1 question for delete a color choice and have only a default color what i change ( all time i had try the result is a mess ) ? thanks @mouse0270:disqus for this work ! Sorry but I am having a hard time trying to figure out what you are asking. @mouse0270:disqus hi! How can i do it on my page? Im a newbie in using bootstrap.. pls. help me. what i have for now is the basic code to implement bootstrap on my page. I really want to create somthing like this. can you please help me? thanks. Sorry for the delay. One of the things I hate about disqus is I don't always get notified when someone comments. I would need to see your page to be able to help with implementation. hi! How can i do it on my page? Im a newbie in using bootstrap.. pls. help me. what i have for now is the basic code to implement bootstrap on my page. I really want to create somthing like this. can you please help me? thanks. But in some case text is behind your navbar, could you fix it ? Could you provide me with the browser you are using. I use chrome and it seems to work with out any issues. could you provide me with a screen shot. I am using the same version on windows 7 with no issue... the button come a little close to the scrollbar, but other than that it seems to be fine. WOW do I feel stupid. You were talking about the content text not the navbar text. haha. Check it out now. To fix the issue you just have to add a left padding of 65 to the body of the document. No thank you, I hadn't even thought about the content. haha. I was way to focus on the navigation. I am glad you pointed it out and helped me resolve the issue.